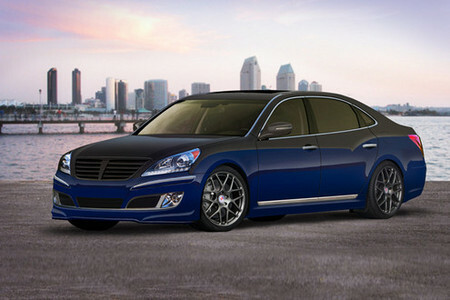 In a rather unexpected move, Rhys Millen Racing revealed their plan for a custom Hyundai Equus to star at the 2010 SEMA show. The Equus is a luxury car and does not really go well with this kinda customizations, but nevertheless, it gets two-tone carbon fiber and Red Bull Racing blue satin clear paint by BASF and HRE 21-inch P40 wheels as well as carbon mirrors, and front chin and rear deck spoilers. Inside the cabin you will find RMR Signature Edition embroidered headrests and floor mats, and ostrich hide leather seats with suede accents. They’ve also tweaked the engine from 385 to 415 bhp and istalled a high performance brake kit with 14-inch discs.